Home » Awesome Stuff To Do » Weirdest. Beauty. Treatment. Ever. Wait, eww, what are those fish doing? They’re, uh, giving me a pedicure. What? A pedicure? Haha, yeah, right, they’re fluttering around beautifying your feet? With their little fishie nail files? They do it with their mouths. What?! They’re biting you? What are they, baby sharks? You stuck your feet in a pool of sharks? Not sharks, “therapy fish.” They zoom in and nibble off the dead skin with their little fish lips. No. No, no, no, no, no. That’s disgusting. I want to un-hear that. Did it hurt? How long was “the whole time”? When I got out, all the parts that were underwater were noticeably smoother! You should try it. That’s what you always say, and look where it got me. Remember the snail slime face mask? Family therapy. Check out the mom’s reaction! If you’d like to visit the Oedo Onsen the next time you’re in Tokyo, directions & a map are on my website, The Tokyo Guide I Wish I’d Had. The fish therapy hut is outside in the courtyard by the foot bath stream. 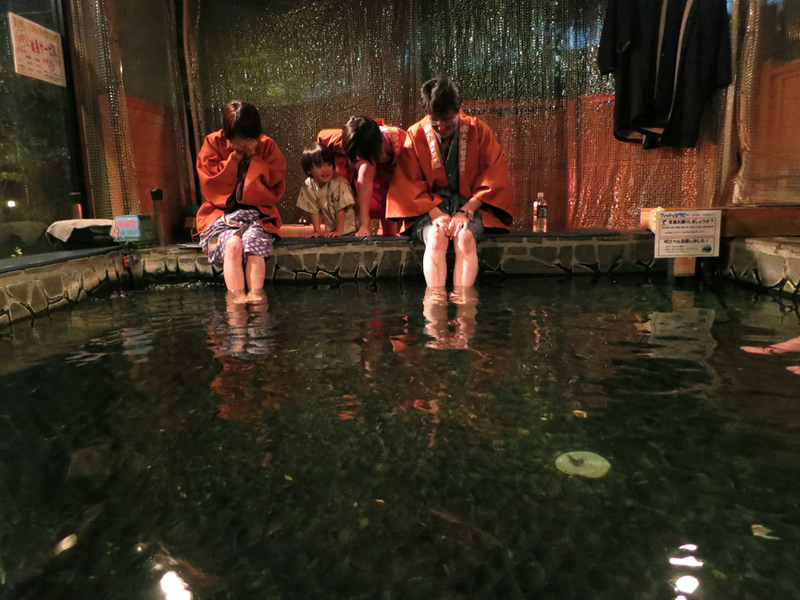 Fifteen minutes costs ¥1575 for adults, ¥1050 for children. There was a big splash (no pun intended) about this on Portland tv — always the closing-feature/human interest spot, of course — about a year ago. 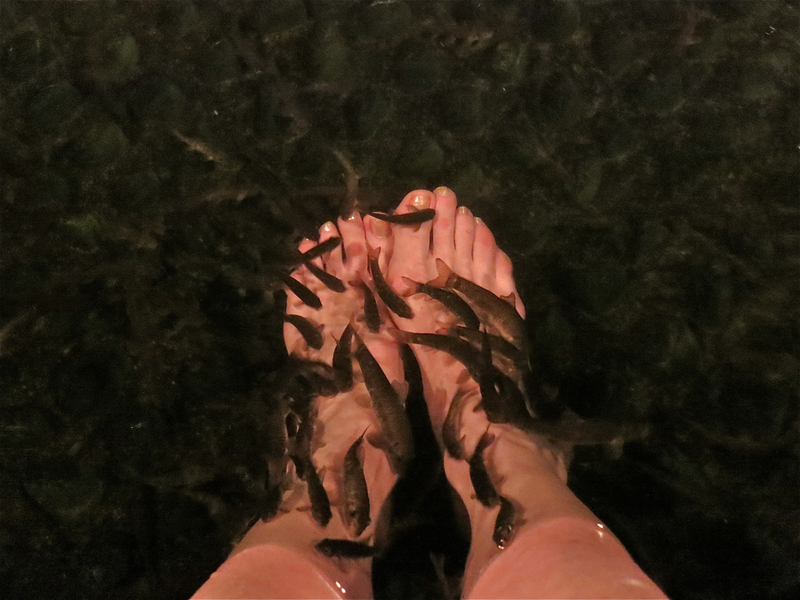 Apparently someone did open a fish-pedicure salon, but it closed after not too long because of health dept. concerns about cleaning the, um, tank? spa? whatever, between clients. I think pedicure by kitteh might end up requiring a few bandaids…! this treatment has actually been around for dang near a decade, although it’s a fairly well kept secret in the US. I recall reading about it as far back as 2006! Yeah, apparently you have to be really careful about rearing the fish yourself in a disease-free environment, or people can get bacterial infections and such. And they did ask before we went in if we had any cuts or scrapes, because you’re not allowed in if you have any. Pingback: Step back in time | Let's Go To Tokyo!